JAL has opened an expanded Sakura Lounge at CTS on March 8 2013. The new lounge is designed by award-winning designer Yuji Hirata from NOMURA. Hirata san is the recipient of Grand Award and Gold Award of the Design for Asia Award 2012. The lounge will open from 7:00 till the last flight of the day. It is equipped with the standard Wi-Fi, WC, and the new charging stations for phones and tablets from DoCoMo, au, Softbank, Apple and Android devices. Although the announcement doesn't specifically call out iPhone 5, the new charging station might not support that because the ITM announcement (see below) specifically mentions that. Other services include newspapers, magazines, snacks, soft drinks, and alcohol. For the snacks, JAL has specifically prepared some Hokkaido products for its passengers to enjoy. 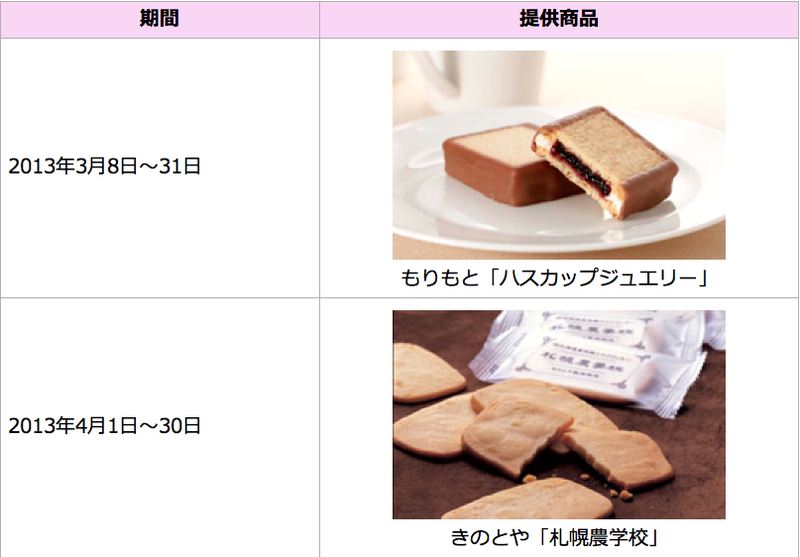 JAL will be serving Haskapp Jewelry from morimoto in March and milk cookies from Sapporo Agricultural College in April. As usual, these items are only available until they run out for the day. Also JAL will provide bowls made from Otaru at the CTS lounges. JAL has completed the renovation of the lounges at KIX, HIJ, KMQ, MYJ, KMJ and KOJ. JAL has put on new wallpaper and carpet. The carpets now match with the rest of the Sakura Lounges in the system so it provides a consistent design. These lounges will also fitted with newly designed JAL original sofas to improve customers' comfort. This will be sequentially rolled out to these lounges from the end of March. So that's why the sofas on the top left pictures look exactly the same as current/old sofas. But it's unclear to me whether the one on the top right is the newly designed sofas though as the ITM lounge rendering (see below) has sofas that look completely different. Also, JAL has increased the number of power outlet significantly in response to business travelers' comments. 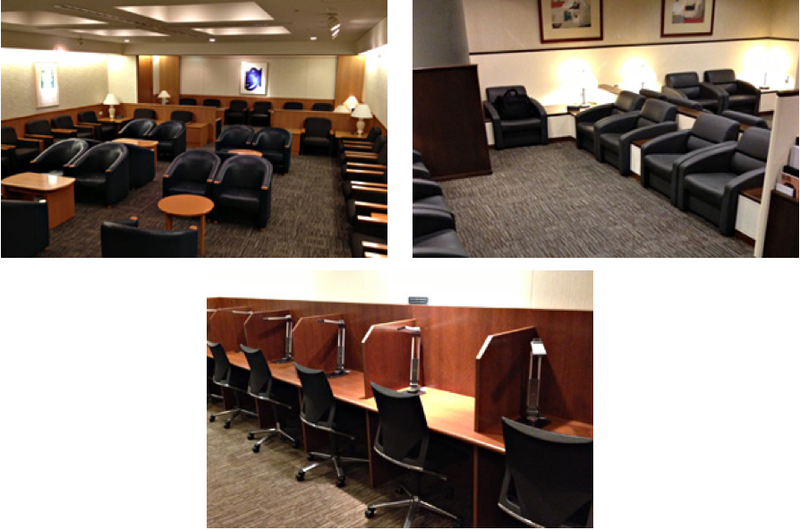 JAL has issued a press release (Japanese only) regarding the lounge refurbishments. It contains specific dates on when new furnitures will be rolled out to these lounges. Not sure if it's an oversight, there's no mention of KMQ in the press release. The Sakura Lounge at ITM will be refurbished on March 31 2013. The new lounge is designed by Japanese design firm Mitsukoshi Kankyo Design Ltd and will open from 6:10 am till the last flight of the day. The renovated lounge will be equipped with telephones, fax machine (for sending), WC, Wi-Fi, charging stations for phones and tablets from DoCoMo, au, Softbank, Apple (iPhone 5 is NOT supported) and Android devices. Newspapers, magazines, snacks, soft drinks, and alcohol will also be provided although unlike the CTS Sakura Lounge, there's no mention of special snacks from Osaka. However, new massage chair will be installed on the 3rd floor. New wallpaper, carpet and JAL original sofas will be installed as well as power outlets will be available throughout the lounge. One thing that wasn't completely clear to me is whether the March 29 and 31 dates are the start of the renovation or the completion of that. I haven't been to those lounges recently. Last time when I was at CTS in December, the lounge was open as usual and I haven't heard any partial closure of these lounges either. So anyone knows? Also JAL is supposed to refurbish the international lounges at Tokyo Narita (NRT), Fukuoka (FUK), Honolulu (HNL), Frankfurt (FRA), and Manila (MNL). So far no news on those yet (although I vaguely remember reading something about the HNL lounge but I am not 100% sure).